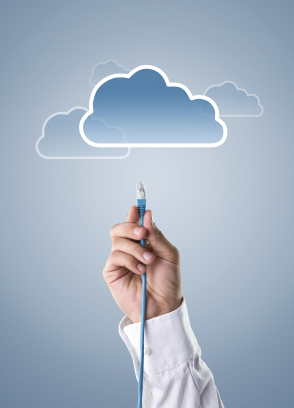 The term, 'the cloud', is fast becoming common in everyday language. But what exactly is the cloud? The cloud, or more accurately cloud computing, is the storing of documents, photos and many other types of files in a secure location on the internet. This allows the stored files to be accessed anywhere an internet connection is present. Cloud storage is about convenience and assurance. You can be visiting friends and want to show them photos of your latest adventure or you receive an email when you're out and about, requesting you reply with your CV. You may have lost your computer or phone, along with all your contacts and notes. "Cloud storage is about convenience and assurance." In each of these situations, if you had uploaded your photos or CV to the cloud, you'd be able to respond right away. Within minutes of purchasing a device to replace your lost one, your contacts and documents can be retrieved from the cloud. You can also share the location of your files with people you trust and they can access those files whenever they need them; doing away with the need to email large files. This can also save precious data if you need to share the same files with multiple people. So who are these cloud storage providers? Google, Apple, Microsoft, Evernote and Dropbox are a select few. And while they all offer online storage, they each have different features and storage options. Google Drive: A free Google Drive account offers 15 gigabytes (GB) of storage. This storage is shared across three Google services; Google Storage, Gmail and Google+ photos. If more storage is required, plans start at 100 GB for $4.99 a month through to 16 terabytes (TB) for $799.99 a month. Documents can be created and stored using just a web browser and can be shared and worked on with others in real time. Mobile apps are available for Android and Apple devices, which not only allow you to share documents from anywhere, but also edit them. Other services include email, calendar and contacts storage. Apple iCloud: Apple’s iCloud is free for those with an Apple ID and is designed for use with Apple's hardware. Five GB of storage is provided free, and increases are available from 15 GB at $21 a year through to 55 GB at $105 a year. This also includes the initial free five GB of storage. iCloud also features document creation and editing online which synchronise on iPad, iPhone and Macs. Apple's mobile apps include Pages, Numbers and Keynote, all of which update documents seamlessly in iCloud. Other services included are email, calendar and contacts storage. Also included is Find My iPhone, iPad and Mac, which allows lost or stolen devices to be tracked. Microsoft Skydrive: This product has built-in Office products, enabling users to create Word, Excel, Powerpoint and OneNote documents within a web browser. These documents can also be shared and edited in real time with friends, family and colleagues. Skydrive also integrates with Office 2013 for Windows, and Office 365, which is Microsoft's cloud-based solution for Windows and Mac. Both of these products allow users to save Office documents directly to Skydrive. Once again, if more storage is required this can be purchased. An increase of 20 GB costs $10 a year through to 200 GB at $100 a year. Apps are available for iPhones, iPads, Android, Windows Phone, Mac and Windows. Evernote: Evernote is more than just file storage and, of all of the cloud services, would be justified in having its own article. In fact, a number of books have been written about the features of Evernote. Evernote synchronises your data across many devices including web browsers, Windows Desktops, Windows Phones, Windows 8 tablets, Macs, iPads, iPhones, iPod touch and Android devices. The advantage of this is that users can work on their notes anywhere. For instance, writers start writing articles in Evernote in order to be able to work on them wherever they are, whenever they have a spare moment or a new idea (See http://blog.evernote.com/blog/category/community/ for ways people are using it to transform the way they work). It can be used for business cards, recipes, to-do lists, reminders, note-taking, photos, and anything else you can think of. Evernote will integrate with the camera on your device and allow you to save photos directly to its servers. Business people will find it handy for snapping photos of business cards. And using Optical Character Recognition (OCR), Evernote will enable searching for text in the business card’s photo. You can create a note and attach various files to it, such as Word or Excel files. The file is stored in the note, similar to an attachment in an email. Evernote also gives you an email address so you can forward email you'd like to keep and have it go directly into your Personal Notebook. This feature allows you to archive important email and reduce your email storage. The data limit for uploads jumps to 1 GB per month. The ability to search inside PDF files is added. Note History is available for past versions of notes. Notebooks can be downloaded for offline use. Changes made to notes upload whenever a network connection is present. A passcode lock can be implemented on mobile devices. An optional web browser plug-in called Web Clipper allows the saving of webpages to Evernote, with links, images and text. Dropbox: Dropbox is a basic file storage service in the cloud. And its simplicity, for many people, is its greatest strength. Like all cloud providers, you need to set up a free account to use Dropbox. Once that is done you need to download the Dropbox application and, upon installing it, a Dropbox folder is added to your computer. To upload files to Dropbox, it is simply a matter of adding files to that newly created folder. They'll be automatically uploaded by the Dropbox application. Any changes made to the files will be automatically synced to Dropbox. From there, you can optionally share files with friends or colleagues. If you are using a public computer, such as in a library or an internet café and you aren’t able to install the application; you can access your Dropbox files from the Dropbox website. Mobile apps are available for Apple, Android, Kindle Fire or Blackberry devices. A free account comes with two GB of storage. This can be increased up to 18 GB via the Dropbox referral plan, whereby if you refer a friend and they create an account, download, install and sign into the Dropbox app, each of you will be granted 500 MB of extra space. The Pro version of Dropbox starts at $9.99 a month for 100 GB of storage, $19.99 a month for 200 GB and $49.99 a month for 500 GB. Alternatively an option is to be billed yearly and save 17 per cent. Although the above are the well-known providers, other popular providers include Sugarsync (www.sugarsync.com) and Box (www.box.com). All of these providers having free but fully functional services available means they can be tested to find which product is the best fit for your everyday use, without the cost. Marry these providers with a smartphone or a tablet and you can have your files available wherever your mobile provider has coverage. And, in the case of the premium version of Evernote, you can have your data locally, edit it and it will sync whenever an internet connection is available. The pricing above is correct at the time of writing. Please check with each service as prices may have changed or may need to be adjusted for your local currency. These prices do not include telco data charges that you may incur when transferring data to and from the cloud.